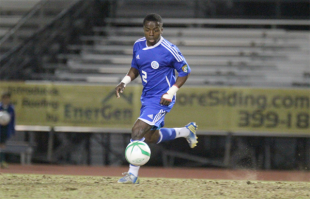 After battling through a scoreless first half, amateur PDL club Ocean City Nor’easters took a 1-0 lead over visiting USL PRO club PIttsburgh Riverhounds when midfielder Ken Tribett put the home side ahead in the 68th minute to set up a nervy finish. In the end, Ocean City prevailed to claim their fifth professional victim in US Open Cup play and advance to the third round where they will face the Philadelphia Union. From the kick-off, this was going to be a tough match for the Jersey Shore side. Pittsburgh Riverhounds was a much bigger, more physical team than the Red Bulls u-23 side that Ocean City had dispatched 2-0 in last week’s US Open Cup first round. For the first 20 minutes or so, possession was all the visitors. The Riverhounds moved forward with both pace and numbers to cause trouble for the Nor’easters defense and keeper Brian Billings. An 8th minute shot a from distance from Pittsburgh’s Matthew Dallman gave Billings some issues but he made the save nonetheless. Still, Ocean City was being taken out of their normal game. The normally fleet footed Nor’easters were forced into playing long balls to try and generate offense. Pittsburgh’s defense remained organized though, clearing long balls and swarming attacking Ocean City players as they entered the final third. A real mismatch was evident when it came to the physicality of the game. One bright spot was Ocean City’s Frank Tweneboa, playing in a withdrawn position. Whenever he was on the ball, he was looking to spring other players. Real pressure from the home side didn’t come until late in the first when last week’s Man of the Match Duke Lacriox steppied up with a shot from the left wing that was easily saved by Pittsburgh goalkeeper Greg Blum. The scoreless half ended with the Riverhounds asserting themselves again with strong wing play from Kevin Kerr, who muscled his way through the OC defense to create a few late half chances. Ocean City came out of the locker room with a little extra in their step and for the first time took the game to the visitors. The Nor’easters began playing the ball one the ground, which is much more their style, and the chances began to pile up with Twenenboa setting up all over the field trying to get players into the attack. Second half sub Emmanuelle Kollie also made an impact though he missed an open shot from a Kevin Curran free kick. Then in the 68th minute, the improbable became reality. During a mad scramble in the Pittsburgh box, Kollie again tried for the near post. A rebound went to holding midfielder Ken Tribbett who slotted it home for a 1-0 lead. The stands and the Ocean City bench exploded with joy as the PDL side went ahead. The goal energized the the closing minutes of the second half, with both teams going end to end. It was nearly game-set-match in the 79th minute when Tweneboa, who had a solid match, streaked in on the Riverhounds goal. A goal looked certain but a heavy touch rolled the ball harmlessly to the keeper Blum. Then a very bizarre play occured in the waning minutes as keeper Blum came out of his area and appeared to clearly handle the ball yards outside the box. Initially ruled a yellow card and a free kick, the ref overturned the call. No explanation was given, but one assumes the ball was ruled offside. Luckily the play had no bearing on the match and the final whistle soon blew. The amateur PDL Nor’easters had defeated professional USL PRO Pittsburgh to move on to the third round of the US Open Cup.